Ever notice how it is just about impossible to find droppers of any sort in drug stores or any other retail outlets? These pipettes hold a total of 7ml, with 3ml marked off on the stem, and are 6 -1/8" long. 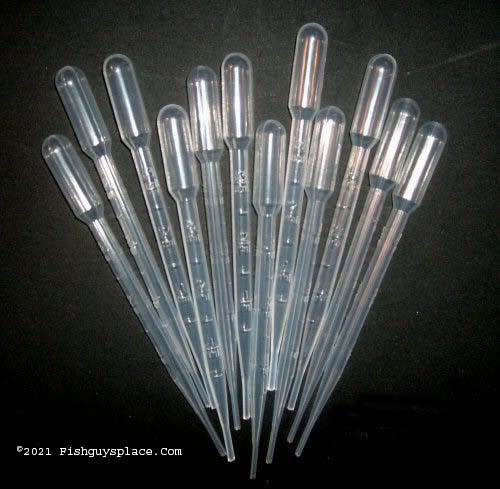 I have sold thousands of these pipettes through the years and they are the single most useful thing in my fish room. Use them for dispensing meds, getting food to where the fry are, water testing, and for a whole host of fish room tasks. Since these are the wide barrel pipettes, with a main dispensing tube diameter of over 1/4", you can snip the tip off with a scissors, and capture/transfer small fry without the potentially lethal trauma of a net. At this price they may be reused indefinitely, disposed of after use or dedicated to a single tank. The above image shows twelve pipettes, but this auction is for a full 100 of the pipettes pictured. USPS First Class Mail shipping is free for this auction. I accept PayPal or USPS Postal Money Orders as payment. Please do not send payment at close of auction. I will send you a PayPal invoice to use for making payment. Please wait for my email and the invoice to pay. Thanks for your interest in my products!